The Adventures of Faith: The Greatest Product EVER! I big pink puffy heart Chai Tea Lattes. If you ever want to get in good with me, need something from me, need to break some kind of bad news to me, or just plain want to make my day, bring me a Grande Nonfat Chai Tea Latte. I will probably love you forever. Last year I had to cut back on my obsession with them. Mainly because everytime I go to Starbucks, it seems that they have raised their prices. I usually only go when I have a giftcard (GREAT birthday present btw, right up there with a Target GC as well) or when I just HAVE to give in to my craving. I never knew it existed! The whole container was just over $4 (half the price of what it's sold for on starbucks.com). A Venti Chai at Starbucks is $4.27! The carton says you can get about 9 servings from it which translates into about 5 when you make enough to fill your travel mug. I can now afford to have Chai Tea EVERY DAY!!!! Ah, yes. We drink cartons of this stuff at work. So, so good! p.s. I have a blog now! 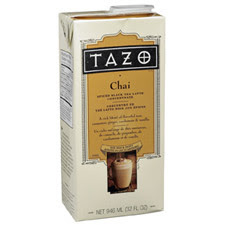 Personally, I'm partial to Oregon Chai mix, but I AM an Oregonian, so that's not surprising. In college, my mom tried to send me a whole box of the stuff along with some winter clothes. En route, one of the cartons ruptured and by the time it arrived, the box and everything inside smelled PUTRID, and was just a big sticky mess of ruined clothes. Despite all that, I still love the stuff.